Connect our DLP – Data Loss Prevention – SaaS scanning and classification engine to your accounts with popular data storage services such as Box, Dropbox and One Drive and get unmatched visibility into your stored data. Connect your cloud service accounts such as Box, OneDrive, Dropbox etc to the sensitivity.io Control Panel and perform data inspection and discover threats based on selected protection profiles. Make sure your sensitive data backups and shared files are always compliant with HIPAA, PCI DSS, FISMA, GDPR, and others to avoid fines, data breaches and other damages. Protect enterprise and consumer app data against leakage and theft using our Remote Cloud Services Scanner. Add value to your mobile apps with strong DLP and other security features. Deploy powerful sensitive data scanners to your cloud apps, discover and monitor content for threats and get instant alerts when your valuable data oversteps your protection policies. Deploy our powerful Remote Cloud Services Scanner to your preferred cloud apps and retrieve all threats according to defined protection profiles. Discover what sensitive information they are storing and take further actions to protect it. Customize the way sensitive data is scanned by establishing a threshold according to your preferred conditions and variables. In this way, you can stop the scanner after a specified number of threats are identified within files, strings or the overall data. Classify returned threats with our predefined protection profiles based on PII, financial records, health records and others. You can start scanning your application for sensitive data immediately, taking one step closer to your data protection goals. 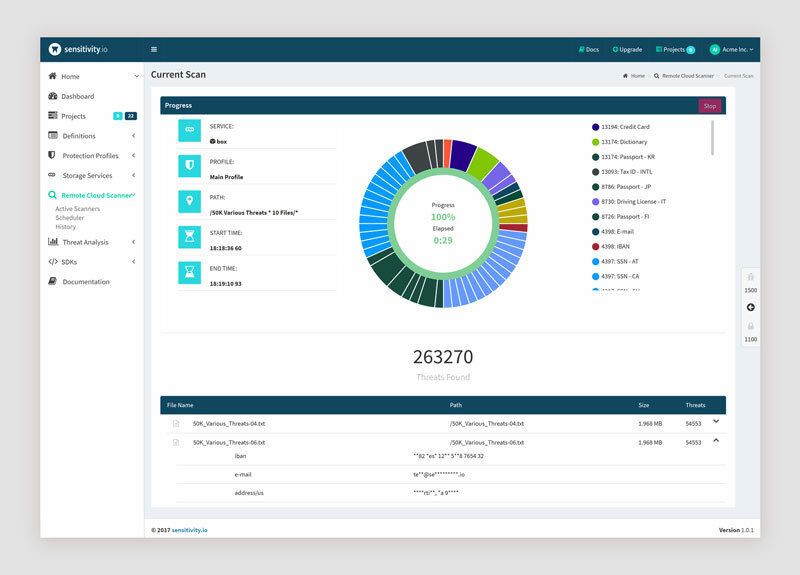 Visualize analytics in our Control Panel, including a threat index, number of identified threats classified by type of data, graphics, projected threats, threat map, and other valuable information for your decision making process. You can add an extra layer of protection to your files on services like Amazon S3 Buckets, Box, Dropbox etc by applying remediation actions such as encryption, deletion or quarantine based on sensitivity.io search results and classifications. Set up real time e-mail alerts for you or your management team regarding discovered DLP threats, the system, your account and billing information so you can take immediate action, prevent data leaks and always be up to date with the state of your sensitive data. Create an account on the sensitivity.io Control Panel, select your plan, and have immediate access to protection profiles, definitions etc. Communicate with your apps and programs and send data for scanning to the sensitivity.io Cloud Services Scanner with just a few clicks.